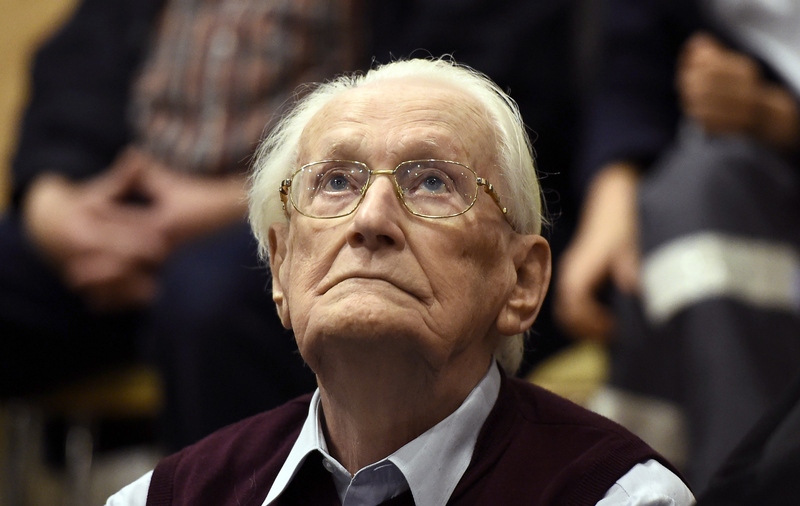 LUENEBURG, Germany -- A 94-year-old former SS sergeant who served at the Auschwitz death camp has been convicted on 300,000 counts of accessory to murder. Groening has testified that he guarded prisoners' baggage after they arrived at Auschwitz and collected money stolen from them. Prosecutors said that amounts to helping the death camp function, and CBS News correspondent Mark Phillips reports that contention made this case a test of new German legal standards for what consititues guilt. His duties have seen him dubbed the "bookkeeper" or "accountant of Auschwitz." The charges against Groening related to a period between May and July 1944 when hundreds of thousands of Jews from Hungary were brought to the Auschwitz-Birkenau complex in Nazi-occupied Poland. Most were immediately gassed to death. Groening said when his trial opened in April that he bears a share of the moral guilt for atrocities at the camp but that it was up to judges to determine whether he is guilty under criminal law. Groening was previously investigated in the 1970s but authorities then shelved the case. Groening has told the Lueneburg state court in a statement read by his attorney that it was hard today to understand the blind obedience he had to the Nazi system even when witnessing the terrible atrocities perpetrated at the death camp in German-occupied Poland. "There was a self-denial in me that today I find impossible to explain," Groening said, the dpa news agency reported. "Perhaps it was also the convenience of obedience with which we were brought up, which allowed no contradiction. This indoctrinated obedience prevented registering the daily atrocities as such and rebelling against them." With the ruling on Wednesday, Phillips says the German court has made it clear that individual murders no longer have to be proven, just working at a death camp is sufficient to bring a conviction and sentence. Phillips notes that Groeing was not immediately imprisoned after the sentence on Wednesday, and may not be pending his likely appeal. Given his age, depending on how long that appeal process takes, it's possible he may never actually end up behind bars.